SKY Movies are the premium movie channels of SKY, the leading (and only) pay television broadcasting service in New Zealand. 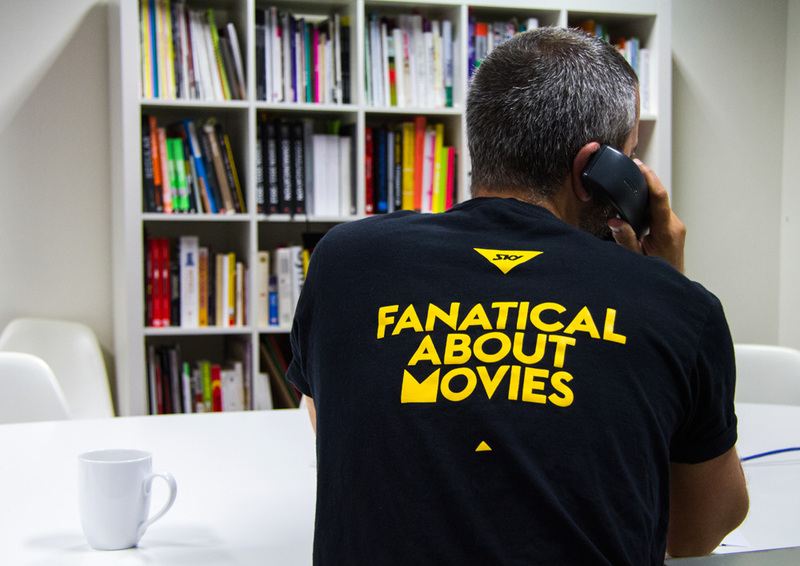 Following the rebrand of SKY Television NZ, we were tasked with creating a seamless connection between the personality and visual identity of the masterbrand, and its hero product: SKY Movies. With over 800,000 customers, this was our opportunity to help SKY craft an iconic brand capable of creating a lasting relationship with Kiwis. Forget the fanciful and mechanic identities common to this category, the new SKY Movies is iconic, creative and charming. From the brand’s inviting tone of voice to its inspiring idents — at every opportunity its seeks to embody its passion for content, dial up its Kiwiness and remaining relevant and exciting for all of New Zealand. As part of the launch and in collaboration with digital agency Sixty40, we created 18 idents using the angular nature of the new brand, sharing SKY’s passion for film. The spots are inspired by movie tropes and tributes, with our SKYangles at the heart of the action. From laugh out loud moments to couch-side cliffhangers — the spots cover the full range of genres and emotions SKY Movies is home to. Each spot captures a moment, concept or insight into the world of movies. They reinforce Sky's positioning as speaking the language of movies fluently and being as passionate about them as their viewers. The design centers around using the Sky brand's triangular "dial" as main characters. The “dial” in use for movies. 1 of 18 idents by Sixty40. This is a great extension from the main SKY masterbrand and the fractal-style animations are quirky and fun. This will definitely need to be revisited in a year or so, perhaps with a more serious triangle approach. Following the rebrand of SKY Television NZ, we were tasked with creating a seamless connection between the personality and visual identity of the masterbrand, and its hero product: SKY Movies. With over 800,000 customers, this was our opportunity to help SKY craft an iconic brand capable of creating a lasting relationship with Kiwis. Forget the fanciful and mechanic identities common to this category, the new SKY Movies is iconic, creative and charming. From the brand's inviting tone of voice to its inspiring idents — at every opportunity its seeks to embody its passion for content, dial up its Kiwiness and remaining relevant and exciting for all of New Zealand. As part of the launch and in collaboration with digital agency Sixty40, we created 18 idents using the angular nature of the new brand, sharing SKY's passion for film. The spots are inspired by movie tropes and tributes, with our SKYangles at the heart of the action. From laugh out loud moments to couch-side cliffhangers — the spots cover the full range of genres and emotions SKY Movies is home to.